CrabDaddy-an all you can eat festival of crabs, beer and wine. 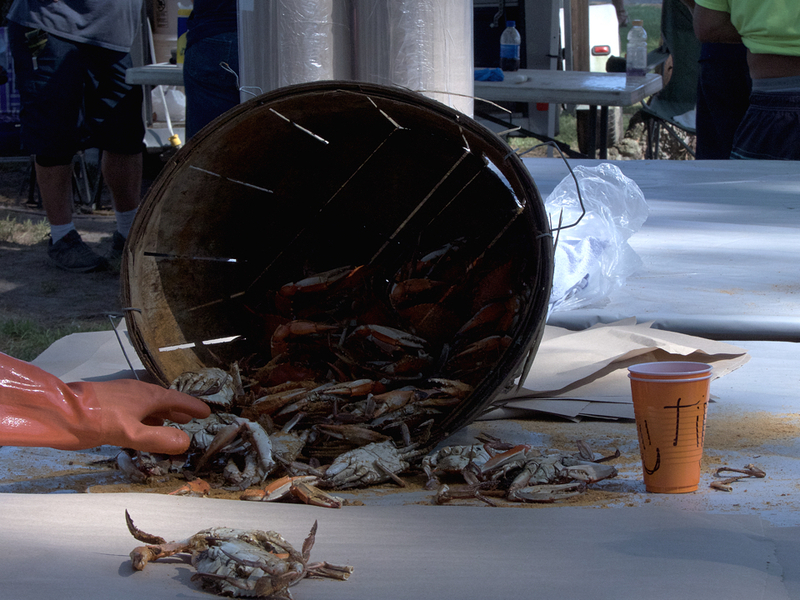 CrabDaddy we have to admit, is one of our favorite Outer Banks events of the year. It’s an all you can eat event serving freshly steamed crabs from I Got Your Crabs as well as some fantastic local eastern North Carolina barbecue. This year the live music was provided by the Jesse Chong Band and Trae Pierce & The T-Stones. And the wine from Sanctuary Vineyards is excellent and there were three local breweries on hand—Weeping Radish, Lost Colony Brewery and Northern Outer Banks Brewing Company—pouring some very nice beers. Sponsored by Sanctuary Vineyards and I Got Your Crabs the event takes place on the north end of The Cotton Gin on the mainland in Jarvisburg. The setting is close to ideal; tall pine trees proved shade from the sun, and this year the sun was shining bright. The temperatures stayed moderate though and beneath the trees shade kept things comfortable all day long. The concept behind the event is a celebration of the grape harvest. In keeping with that there his the Great Currituck Grape Stomp, an event that proves stomping on grapes with bare feet is not the best way to extract the juice. What happens in the competition is two wooden tubs are filed with grapes—it looked like muscadine grapes. A team of two contestant climb into each tub and proceed to stomp on the grapes hoping to be the first to fill a vessel that is catching the juice. A sticky, sloppy mess—grape juice is very sugary—kids and adults find common purpose in the event. The wine grape harvest this year at Sanctuary , looks like it will be ok, although it’s still too early to be sure. The summer weather was fickle with way too much rain in July followed by an August drought. They did get most of the grape picked before Hurricane Florence brought rains to the ares, so there is hope. We’ll know next year at the 2019 CrabDaddy when the first of this year’s vintage is poured. CrabDaddy is just one of a number of great Outer Banks events. For the best accommodation to enjoy all the Outer Banks has to check out Joe Lamb, Jr. & Associates.